Students from Crossroads Charter Academy in Big Rapids assisted in planting native plants in Mitchell Creek Park on May 19. Partnering on the project were Timberland RC&D, Mecosta and Muskegon Conservation Districts, City of Big Rapids and the MRWA. Funding for this project was through a Clean Michigan Initiative grant. With a donation from the Mecosta County Audubon Club and a match from the Wege Foundation, the MRWA was able to purchase more native plants to supplement the 2004 planting at Mitchell Creek Park and install signs informing the public where the plants are growing. 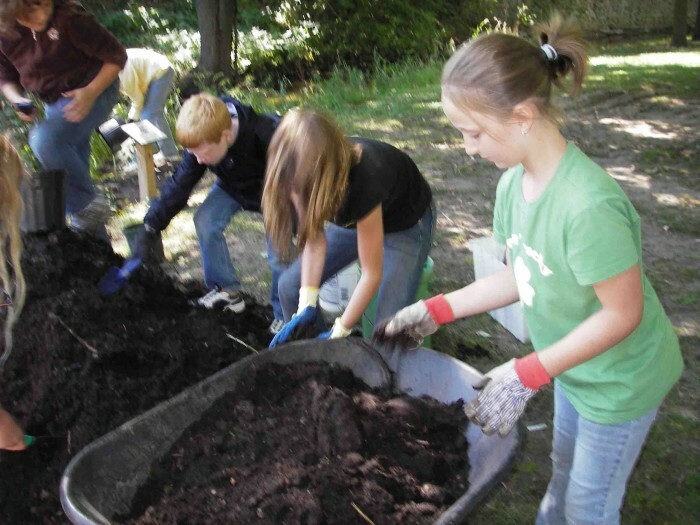 Partnering with the MRWA on this project is the Mecosta Conservation District, Master Gardeners, students from Crossroads Charter Academy (pictured below) and the City of Big Rapids. On May 18, 120 Michigan native plants were planted to supplement the 2004 planting. Planted areas were weeded and mulched. August – Signs have been installed and the plant beds were weeded. Linda Sanderson (MRWA Volunteer), Charmaine Lucas (Mecosta Conservation District) and Terry Stilson (MRWA) weeded, mulched and added a few plants to the Mitchell Creek Park beds in June. Devastation came to the Park’s flowerbeds when a large storm flooded the Park on July 27. Two cleanups were conducted in Mitchell Creek Watershed – one in April and the other in September. In September, the fifth and sixth grade class from St. Peter’s Lutheran School planted additional plants in the beds. Students from St. Peter’s Lutheran School planted flowers in the Mitchell Creek Watershed.